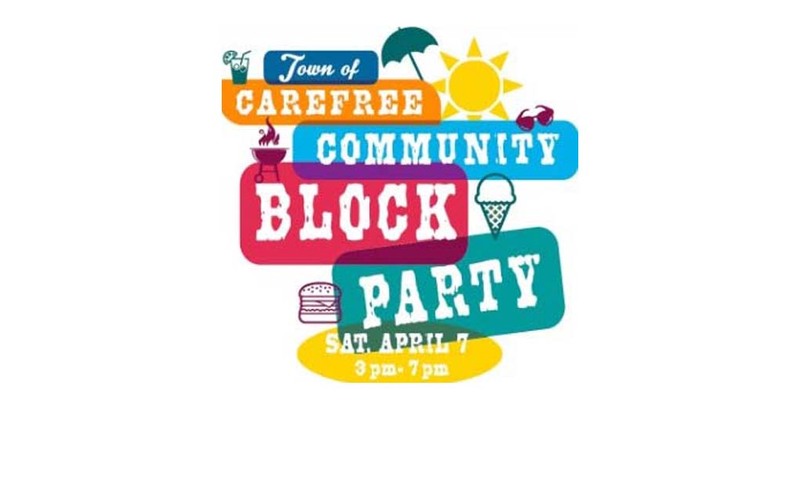 CAREFREE – The Town of Carefree, in the spirit of friendship and celebration, announces its first annual community block party to be scheduled Saturday, April 7 at 3 p.m. – 7 p.m. located in downtown Carefree along Easy Street and the Sanderson Lincoln Pavilion. Carefree residents, Foothills neighbors, businesses and non-profits of the Town are all invited to join in on the food, music, activities and fun for all ages. Entrance is FREE and the cost for a meal ticket is $6 and includes a hamburger, hotdog, chili various side dishes and one non-alcoholic drink. There will be other items for purchase such as ice cream. Highlights will include a hotdog eating contest featuring Nathan’s famous hot dogs a dunk tank, Corn Hole Tournament, a beer & wine garden plus the grilling of hamburgers and hotdogs. The Kiwanis Splash Pad will also be open along with other activities such as free face painting, a music DJ, Zumba, karate, mini putt golf, kid’s lemonade stand by the Desert Foothills YMCA, raffle prizes/baskets and more! “This will be a good time to reminisce with friends, meet new neighbors and enjoy our downtown business district. We hope this becomes an annual tradition,” shares Les Peterson, Mayor of Carefree. Sponsors of the event include 4CMedical Group, Edward Jones, Tyrol Title, Liberty Utilities, Ted Phillip Denton Contemporary Art, and Happy Fitness with Patricia. Participating local restaurants include Corrado’s Italiana Cucina, Carefree Coffee Roastery, The Meat Market, Black Mountain Coffee Shop and Café and Venues Café. Non-profits and partners also benefiting include Carefree Cave Creek Chamber of Commerce, Carefree Water Company, Desert Foothills Foodbank, Desert Foothills YMCA and Foothills Caring Corps. RSVP’s are suggested at Events@Carefree.org. If you are a local business and want to attend and/or volunteer, please contact Vicki@carefree.org or contact 480-488-3686.